The enchanting beachfront location, along with the lovely stone staircase and wooden awnings, make Powerhouse Park and adjacent Seagrove Park a favorite wedding venue. The expansive grass lawn and beautiful landscaping also make for a perfect sand-free picnic or sunset-gazing location, too. In 2019, Carmel Valley will get another retail destination in the form a One Paseo Place, a residential, office, and mixed use property. Shake Shack, Salt and Straw, International Smoke barbecue house, and SoulCycle have already signed on as tenants. Where: On the beach west of Coast Blvd. and south of 17th Street. Immediately north of Powerhouse Park you’ll find Jake’s Del Mar and Poseidon Restaurant. These well-liked upscale seafood spots would have to be in the ocean to be any closer to it. Alongside Ahi poke bowls and mixed seafood pots, there are Duroc pork Cuban sandwiches and burgers. In addition to plenty of salads, Poseidon Restaurant serves calamari sandwiches, clams, crab cakes, and seafood cioppino. Del Mar’s main drag, also called Del Mar Village, unfolds along several blocks of Camino Del Mar (a doubly-named stretch of Hwy 101), between about 10th and 15th streets, and well within earshot of the surf. The sophisticated vibe of Main Street comes through when strolling past boutiques like Durante’s Menswear and Joni ANND Susi. You can tuck into at least two dozen eateries ranging from the upscale American fare at Zel’s Del Mar and Pacifica Del Mar—both complete with patios for savoring the sunset—to Mexican cantinas, fine dining, brunch, and sandwich spots. 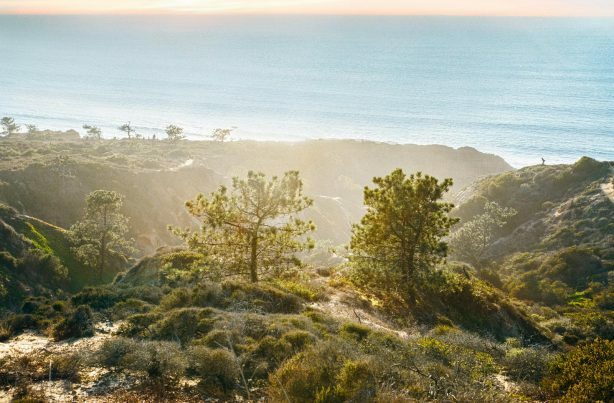 No visit would be complete without communing with the area’s most famous residents: Torrey Pines, elegant trees so rare they grow only here and on one of the Channel Islands. Join the many hikers and walkers on the network of gorgeous trails that wind along the bluffs and down to the water’s edge. With that scratched off your list, head just north of the adjacent Los Penasquitos Lagoon, to a tucked-away commercial district. Though small, it’s packed with local favorites like Torrey Pines Coffee Bar, the original Roberto’s Taco Shop, the Italian bistro Seasalt Del Mar, global cuisine eatery Iris Food and Spirits, and intimate Northern Italian restaurant Trattoria Ponte Vecchio. State Route 56 snakes through Carmel Valley, traced by a paved 10.5-mile bike path. This open ribbon of asphalt, free of road crossings for long stretches, makes an ideal route for running, bicycling, and even horseback riding. The scenery alternates from verdant wetlands to open vistas of San Diego’s mountainous eastern flanks. Bust out your seersuckers and fascinators and place your bets. Del Mar’s legendary racetrack has been an institution since Bing Crosby welcomed the first guests in 1937. In addition to the horse races, the track hosts the annual county fair and assorted conventions, making for a full year of music, food, and excitement beyond the thrill of watching your horse round the last bend in the lead. From luxury to economy, hotels in Del Mar provide access to golf, shopping, and of course, the blue waters of the Pacific! The Fairmont Grand Del Mar is a five-star resort that delivers on its promise of a luxury experience. From the award-winning spa and signature restaurant Addison, guests are transported to a relaxing Mediterranean escape overlooking canyon vistas. Hilton San Diego – Del Mar offers best-of-class services just steps from the famed racetrack. San Diego Marriott Del Mar is not only is central to major business headquarters, but just minutes from Torrey Pines State Reserve. For more budget-friendly options, the Hilton Garden Inn and Homewood Suites by Hilton both offer comfortable accommodates close to Sorrento Valley and Del Mar.